Likud members receive a call from four-year-old Emunah from Migron. She begs them: Stop the demolition of our community. Thousands of members of the Likud Central Committee received a phone call on Saturday evening from a child living in the village of Migron in Binyamin, who expressed her fear of the planned demolition of her home by Prime Minister Binyamin Netanyahu. Upon picking up the phone, the Committee members heard a recorded message from four-year-old Emunah of Migron, asking for their help in thwarting the upcoming demolition. “This is not a legal issue but a political one,” the message said. Migron has been declared illegal by the Supreme Court and the government has been told to destroy the entire community, home to 47 families, by next March. In September, security forces in large numbers marched into the community in the middle of the night and demolished three homes. At the root of the problem are several issues: Supreme Court Dorit Beinisch has ruled recently that land in Yesha (Judea, Samaria, Binyamin)that has no proven Arab owners but is not designated as state land is to be considered Arab land by default rather than state land; the court does not consider suggesting payment or alternate land in the rare cases of Arab landowner claimants whose claim is found to be justified; the state aided in the founding of certain communities without determining their final status and the court has ruled on demolitions without that final determination. The community has been a constant target for Peace Now, which has claimed that Jewish homes there are located on property belonging to PA Arabs. Two other communities – Givat Assaf and the Ulpana neighborhood in Beit El – are also slated to be demolished in the near future. Several MKs have already joined together to find a solution to the planned destruction in the form of legislation, while putting pressure on Netanyahu and the defense system to stop the demolitions. The initiative is being led by National Union chairman MK Yaakov Katz (Ketzaleh), coalition chairman MK Ze’ev Elkin (Likud) and MK David Rotem (Yisrael Beiteinu). MK Yariv Levin, chairman of the Knesset’s House Committee, has also joined the initiative. 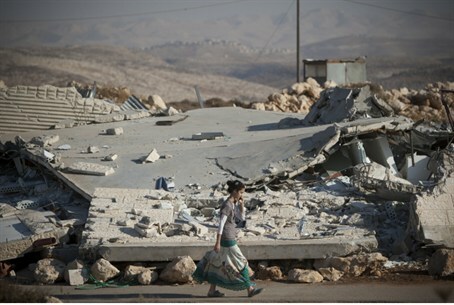 Levin recently announced that he intends to submit legislation to the Knesset to prevent demolitions of Jewish homes. The second bill is an amendment to the real estate law that would state that if unregulated land is built upon with the State’s authorization or with its assistance, it will be considered state land. If an Arab subsequently claims and proves that he owns this land, he may sue the State for compensation for the value of the land before construction started on it. MK Katz, meanwhile, is leading another initiative in which he hosts government ministers and other MKs in the communities to be demolished, so they can see with their own eyes the importance of Jewish settlement in Judea and Samaria.